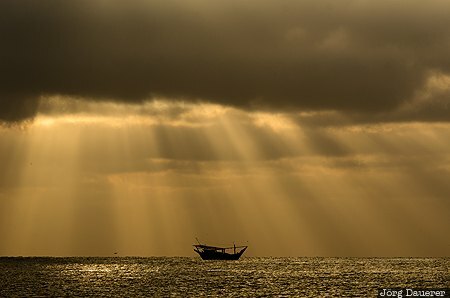 A colorful sunrise sky and sun beams above a lonely dhow (or dhau) in the Arabian Sea seen from the coast near Al Khaluf in the early morning. Al Khaluf is in Al Wusta in the east of the Sultanate of Oman. This photo was taken in the morning of a sunny day in March of 2012. This photo was taken with a digital camera.